Angie in T.O. : JERSEY BOYS GETS EXTENDED AGAIN! 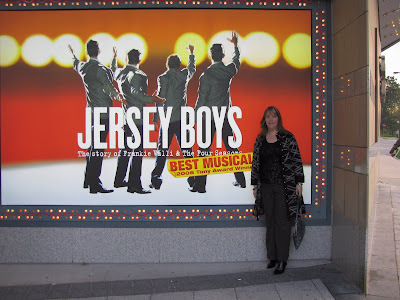 I woke up to happy news, the "Jersey Boys" has been extended here in Toronto right through the summer, until September 27th, 2009! I love this musical. I first saw it back on March 24th with a girlfriend and was truly blown away. I left the theatre knowing I'd be back to see it again. I purchased first row of "premium seating" (which means your actually in the 3rd row) for Rob and I to attend on Saturday, May 2nd not long after seeing it. It was amazing, again! And it was great to be so close. Seeing the facial expressions of the actors helped get me into the story even more, as well as all the great songs. Rob really enjoyed the show too, more then he thought he would. It's hard not to sing along and get up and dance! I'm glad you get a small opportunity to do that at the end of the show, it's much needed! As much as I love all the music in the show, it's Frankie Valli's story that truly impresses me. His loyalty to his friends, even when they may not of deserved it, is heart warming. Jeff Madden, a local actor plays Frankie like he was born to do it, and the whole cast if fantastic. It's a show you can't see just once and I'm sure I'll be seeing again now that it's been extended for a few more months, and they say "third times the charm!" Where did you hear the show has been extended? I had an e-mail from DanCap yesterday, I'm a member.